The Indian restaurant sector has paid tribute to the sad news of the sudden death of Peter Gove, founder of National Curry Week and the Curry Tree charitable foundation. Peter suffered a fatal heart attack on 15th June whilst on holiday on Gran Canaria with his wife Colleen. He was 74. Born in Hornchurch, Essex in 1942 he was educated Ilford County High School, Exeter University, then London School of Economics. In a rich and varied career Peter achieved much. In his youth he represented Essex, Southern Counties and England in swimming and Essex in water polo. He was also a keen club tennis player. He started his working life as a statistician with the Union Castle Shipping Company before moving into in to the travel sector; planning specialist tours such as West Ham FC in Europe and England Football Supporters Club to Mexico World Cup. He then worked with BOAC/British Airways and several other airlines, travelling the world. He ran his own travel company, creating The World Sports Supporters Club. In the 1960s he moved into sports journalism working for ITV’s World of Sport, Daily Express and Daily Mail and was an early member of the Sports Writers Association (now Sports Journalists Association. He edited Florida World News and All Sports International newspaper for 10 years and continued to edits the online version until his death. In the 1970s Peter began making TV style travel documentaries on Zambia, Malawi, Australia, Kenya, Florida and the Caribbean. He served under Sir Rocco Forte and Lord Westmoreland on the fundraising committee for the 1978 Commonwealth Games, organising a round Britain Radio Luxemburg roadshow to raise money for the England teams. A published author, his works included Ergonomics of Sport & Leisure Facilities, World of Sport Almanac and Sports Form Guide. He also wrote a sci-fi novel, The Levellers, published by Robert Hale (1981) and a series of children’s books entitled The Bornington Chronicles. His latest novel, A Plague of Paradise, was published in 2013. Peter edited Guide to UK Hotels with Leisure Facilities for Harmsworth, part of the Daily Mail Group; the National Restaurant Directory for sponsors Carlsberg; then The Real Curry Restaurant Guide from 1990. Other restaurant guides included The Oriental Restaurant Directory, The Italian Restaurant Directory and The Mood Food; the Florida Restaurant Directory; Florida World News; Spice n Easy, Masala; and Menu Magazine (now Mood Food Magazine). He was a regular freelance contributor to the national press and appeared regularly on radio and TV as an expert in ethnic food and drink. Peter started the Best in Britain Awards (BIBA) for the Asian restaurant sector in 1992, National Curry Week (originally National Curry Day) in 1997 and Curry Capital of Britain in 1999. He worked with The Chartered Institute for Environmental Health for 3 years, running their National Curry Chef competition. Peter co-wrote Curry Culture – a very British love affair with his wife Colleen and The Flavours of History published by Godiva in 2011. He ran several major websites on ethnic food and drink and sport which generated over 1 million visitors a month. He was President of The Federation of Specialist Restaurants and founder of The Curry Tree Charitable Fund. Now in its 19th year, National Curry Week allows curry restaurants, caterers, pubs, and home cooks to celebrate the cuisine and culture with special dinners designed to generate much need charitable funds for various good causes – at home and abroad. The highlight of National Curry Week was the Curry Capital of Britain, where cities compete for the coveted award, through a combination of the quality of the food and fund raising activities. The idea behind the event, which has been held annually since 2001, arose from adverse publicity following racial unrest in parts of London which spread to other cities across the UK. The motivation was to provide a showcase for UK cities to promoting multi culturalism. The focus was on the cooperation between the council, restaurants and education bodies to promote the curry industry, alleviating unemployment and promote community cohesion. Only five cities have been named Curry Capital – Bradford, Glasgow, Leicester, Birmingham and West London. His widow Collen to whom he was married for 30 years, said: “I can think of no better lasting tribute than to continue the work he started with National Curry Week and The Curry Capital of Britain. 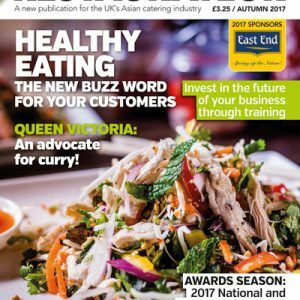 Their role in highlighting the contribution made to the wider community by the Asian restaurant industry was a message that was very dear to him.